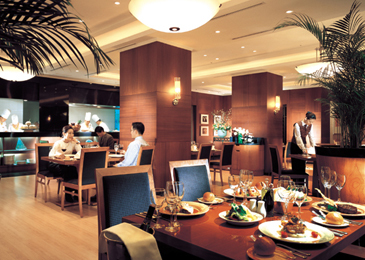 Café de Chef at Sofitel Ambassador Seoul celebrates the new year 2006 and works up your appetite with a special set of Korean health dishes. During the special promotion, guests can enjoy a specially selected set of Korean traditional health food such as "Abalone, King Prawn, Scallop, Clam and Bean Paste Soup in Stone Pot," "Korean Traditional Braised Beef Tail," "Broiled Yuja Soy Sauce Marinated dried Pollack (or Yuja chili sauce)," "Chili tasted Fresh Pollack & Clam Soup (or Clear Soup)," "Tofu, Mushroom and Fresh Oyster Soup." ll menus are available for the price of 25,000 won ~ 45,000 won. Above special health menus perfectly serve as lunch for office workers as well as family gatherings and business meetings with 3 private rooms. Come to Café de Chef and begin your New Year with our special New Year Korean menus with special people. The special menus are available through the end of February.